When we have beef short ribs it is a real treat on our table. 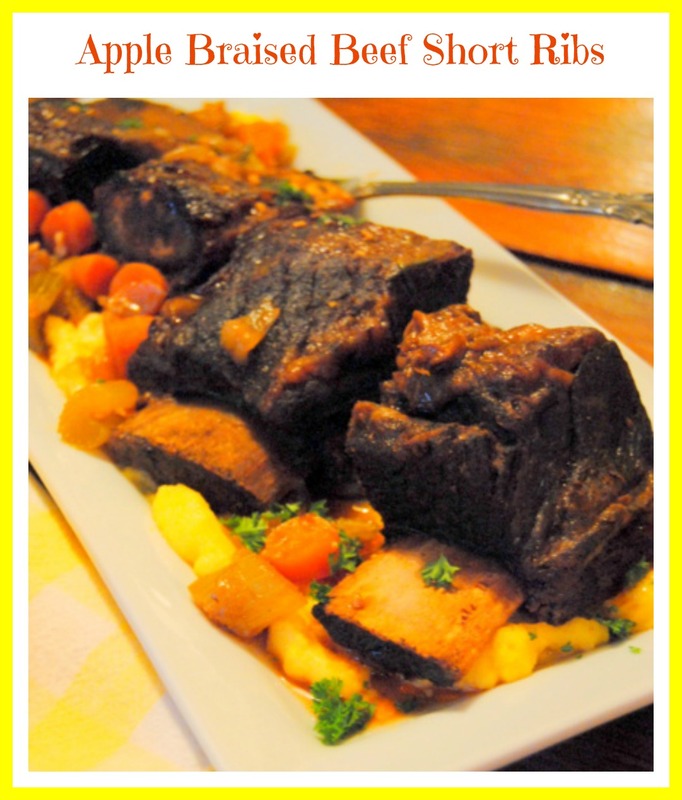 I have used several different recipes through the years, but the Apple Braised Beef Short Ribs recipe is definitely our favorite. These ribs are cooked slow and easy with a mix of flavorful vegetables and a kick of apple. The spice mix for this recipe is simple yet leaves these ribs something to remember and ask for again and again. We are serving the ribs on a creamy polenta and drizzled the gravy on top. This is a wonderful meal. Wash and dry the short ribs, then salt and pepper on all sides. Place the short ribs on a shallow baking sheet and roast them in a 400 degree oven for 6 minutes on each side. In a heavy dutch oven, heat the olive oil, then saute the onions, celery, carrots and garlic until the onions are starting to clear. Add the salt, pepper, cayenne pepper. Stir in the tomato paste until vegetables are completely covered. Add 1/2 the beef broth and apple juice. Place the short ribs on top of the vegetables. Pour in the remaining beef broth and apple juice. Place the rosemary and thyme sprigs on top of the short ribs. Place a lid on the dutch oven and bake in the oven at 325 degrees for 2 hours. Remove the short ribs and vegetables then reduce the liquid for a thicker gravy. Just Drizzle Some Of The Gravy On Top and It Is Delicious! I always look forward to you stopping by and spending time in the kitchen with us and sure hope you enjoyed these ribs today. Have a fantastic week and come back to see us real soon! Oh Miz Helen I adore the idea of a touch of apple. I can't wait to try this delicious recipe. I hope you are enjoying a lovely spring and may you have a wonderful week. It sounds delicious as I am also a big apple fan.